Home > Bacteria in Everyday Life > What is Otitis Media? Otitis media is the medical term used for an infection of the middle ear. The infection can either be viral or bacterial in nature. Usually, an infection with a virus such as one of the common cold viruses sets up inflammation in the inner ear that usually reduces and clears up in a few days. However, as with the common cold generally, an initial viral infection opens the cells up to secondary infection by bacteria. Bacteria that usually live in the upper respiratory tract find their way into the inner ear through a small tube called the Eustachian tube, that leads from the back of the throat into the ear chamber. As the bacterial infection takes a hold, pus and fluid and inflammatory cells build up in the inner ear and cause a fast increase in pressure. 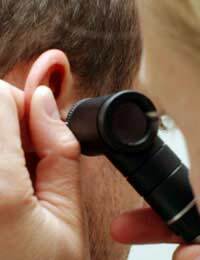 The pressure on the ear drum, together with the soreness inside causes sometimes excruciating earache and the person with otitis media often has a temperature of around 102 degrees Fahrenheit, three or four degrees above normal. Middle ear infections are very common, particularly in children under seven years old. As the head is growing, the Eustachian tube is at a much shallower angle than in an adult skull and bacteria can track into the inner ear much more easily. Children of this age have a generally lower resistance to the viruses that cause the common cold and catch the infections that are a prelude to otitis media around 12 times each year. Adults who don't have young children may get 1-2 colds each year, so have a much lower risk of ear infection. Toddlers are highly susceptible and may experience a middle ear infection several times. Ear infections can become chronic, but they are generally over within days. Doctors today try not to give antibiotics unnecessarily because of the risk of encouraging the development of antibiotic resistant strains. However, the treatment of otitis media is difficult for two reasons. Firstly, it is hard to distinguish a middle ear infection caused by a virus only, and one where bacterial secondary infection has occurred. Both can cause the same symptoms, including the very bad earache. Holding off treatment for a screaming toddler, obviously in pain when there is no evidence of bacterial infection is never popular with parents. A viral otitis media can very quickly become contaminated with bacteria, and the pressure build up can be so great that the eardrum actually bursts. A perforated eardrum is usually an obvious sign that bacterial infection is present, but waiting until this happens is also an unpopular move with parents of young patients. Which Bacteria Cause Otitis Media? Several species are known to cause middle ear infections, but the two main species are Haemophilus influenzae and Streptococcus pneumoniae. Both cause infections in young children but H. influenzae is the primary cause of otitis media in teenagers and young adults. Is Otitis Media the Same as Glue Ear? No, but the two conditions can be related. Middle ear infections that are caused by a viral but not a bacterial infection usually clear up quickly, but they can lead to a chronic build up of sterile fluid in the middle ear. This increases the risk of otitis media as secondary bacterial infection is always a possibility. However, the fluid can remain sterile but does become thick and sticky over a few weeks. The hearing is affected and this can get worse as the fluid becomes thicker. At this stage, the term glue ear is used to describe the condition that has developed.